There is nothing quite like the effect of a fire. It creates a wonderful feeling of comfort and cosiness with the added dimensions of a warm glow that it brings to any room. The coal effect real flame open type gas fire is the most popular fire on the market and purchased for their stunning visual flame appearance. As with all modern gas fires, they have a safety cut off device [FFD] in the event of flame failure, and an atmospheric sensing device to monitor the oxygen levels in the room and cut off the gas to the appliance in the event of the flue becoming blocked or poor room ventilation. These fires are the ideal combination of flame effect and high efficiency, and sit on a hearth on the face of the chimneybreast or fire surround. Some can be wall mounted direct to chimneybreast without a hearth. Traditional type of fire with three o four white ceramic radiants, these fires need the same requirements as the glass fronted fires. 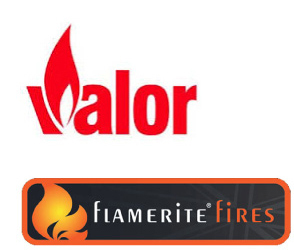 These fires look the same as glass fronted fire but without the need for a conventional chimney; it is fitted directly onto an outside wall with the flue passing through the wall, it can be fitted with or without a fire surround. The modern electric fire is far removed from the old one or two bar fires and now are more like traditional coal effect fires with a unique flame effect pattern to give the impression of a real fire, it also incorporates a convector heater. 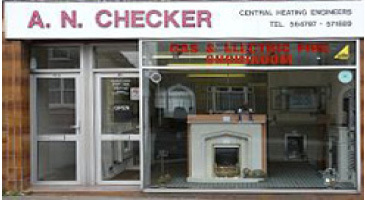 They have the added advantage of not needing an annual service or perhaps a lengthy gas supply pipe, just put in place and plug in to a suitable electrical socket. 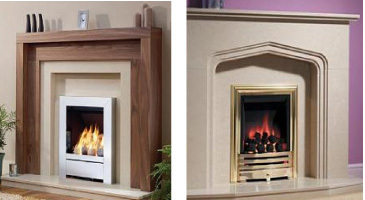 All electric fires are 100% efficient at the point of use all the heat produced goes into the room. The 'flames' can also be used independent of the heating for a cosy effect without the heat. There is a choice of coal or pebble effect, traditional or ultra modern fires to suit every decor from hole in the wall installation to fire surrounds. 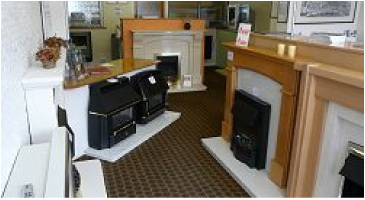 You can also purchase complete electrical suites, which include a fully assembled fire surround and fire. 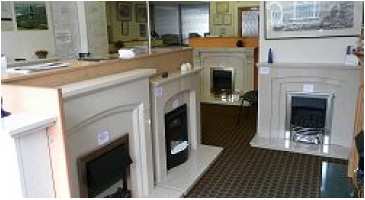 We have four fires on live display in our showroom. OUR SHOWROOM is open: Mon to Fri 10am ? 4pm You are welcome to come in and look around, free from any sales pressure. Information and friendly advice is there for the asking; free brochures and leaflets are available for you to take home.